Sean O'Leary is a who works in Reading at The Royal Berkshire, and The Berkshire Independent Hospitals. His early medical training was at Cambridge University and St Mary's Hospital, Paddington and his specialist Orthopaedic training was on the NW Thames rotation (London). This concluded in 2000 with Fellowships in knee arthroplasty (replacement) and knee ligament reconstruction at Monash Medical Centre, Melbourne and The Prince of Wales Hospital, Sydney, Australia. He started working as a consultant at the Royal Berkshire Hospital in January 2002. Sean specialises in all aspects of knee surgery including arthroscopic (keyhole) surgery, , realignment surgery (osteotomy) and /. He maintains comprehensive data collection on the outcomes of his surgeries and is one of a very few surgeons who can evidence the success of his practice and patient outcomes with such data. Sean is frequently asked to offer a second opinion on complex knee injury or revision (redo) surgery. 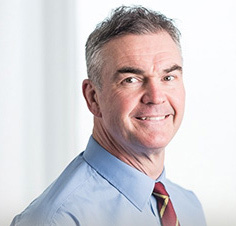 Sean works closely with other musculo-skeletal professionals - Radiologists, Orthotists and Physiotherapists - to ensure a prompt initial diagnosis and optimal recovery from any surgical procedures. Such involvement with the (detailed) rehabilitation programmes allows for optimal recovery from injury and may avoid the requirement for surgery. Sean has played first class / International rugby (Wasps, Bath, Saracens, Barbarians, England B), played National League basketball (Plymouth Raiders), competed in the British Indoor rowing championships and is a keen cyclist. With such an extensive sporting background, he has a strong interest in sports knee injuries, their management and understands the complexities of performance and recovery in athletes of all abilities. Furthermore, Sean is long term advocate of the recording and reporting on patient outcomes in both the local and wider population. He was a co-founder of The (UK) National Ligament Registry – which records the outcomes of ACL reconstruction in the UK - and was Chairman from 2013-16. He is a keen teacher, regularly presenting to local groups of physios, GPs and patients as well as presenting his work at National and International conferences.